Yerevan, August 17, 2015 — With a festive ceremony held on August 14, the Hayastan All-Armenian Fund unveiled the newly refurbished school of Khachardzan, a village in Armenia’s Tavush Region. Completely renovated and refurnished with the financial support of Mr. and Mrs. Arto and Hilda Kalciyan, longtime benefactors of the fund’s Argentinean affiliate, the campus will open its doors to students next month, at the start of the new academic year. The renovations include much-needed upgrades of the facility’s natural-gas and heating systems. In addition, the Kalciyans have donated a minibus to the school. The vehicle will be used for student transportation and to meet various community needs. Khachardzan, which has a population of around 480, always welcomes the Kalciyans with open arms. The benefactors have sponsored a number of development projects in the village, including the construction of a health clinic and a multifunctional hall, as well as the provision of stationery and school supplies to schoolchildren. The Kalciyans have also encouraged the growth of the community’s population. Today they continue to support Khachardzan by helping boost its economy. Toward this goal, they will soon donate up to 500 beehives as well as honey-production equipment to the community. At the school’s unveiling, the Kalciyans led a delegation of Argentinean-Armenian benefactors, whose visit in Khachardzan has signaled further development prospects for the village. One key project emerging from their visit is the forthcoming reconstruction of Khachardzan’s potable-water network. The Kalciyans and two other families, the Terzians and the Avakians, have pledged their joint sponsorship of this major initiative. Currently the Terzian family is also studying ways of promoting sports in Khachardzan. 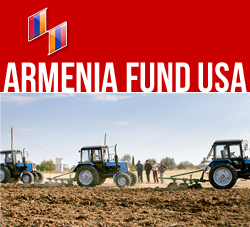 In the words of Ara Vardanyan, executive director of the Hayastan All-Armenian Fund, “Our fellow Armenians in Argentina continue to invest in vital infrastructure-development projects throughout Armenia and Artsakh.” Vardanyan also noted that “During the Kalciyans’ previous visit in Khachardzan, the community saluted its beloved benefactors by naming them Honorary Citizens of Khachardzan.